NEW YORK (WPIX) – Celebrity disc jockey DJ AM – also known as Adam Goldstein – was found dead in SoHo Friday. This Saturday we will be bringing you a reggae tribute to Michael Jackson inside the Kress Restaurant for the King of Pop’s birthday celebration along with the best in reggae, dancehall and hip hop. One of the best Dj’s around Pj Butta will be bringing the dance vibe all night to the Kress restaurant. Pj Butta killed the last MJ reggae tribute playing reggae covers of MJ’s biggest hits mixed in with his original songs and remixes. So come out Saturday night to dance to the reggae/hip hop vibes and celebrate the King of Pop’s earthstrong. Take a listen below to some reggae covers of Michael Jackson hits. BERLIN — Usain Bolt was honored by the city of Berlin by receiving an original segment of the Berlin Wall — nearly three tons of it. 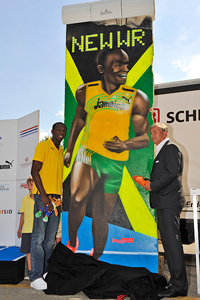 AP Photo/Gero Breloer Usain Bolt was honored Sunday by Mayor Klaus Wowereit, who gave the sprinter a piece of the Berlin Wall with a custom paint scheme. The Jamaican sprinter, who broke world records in winning gold medals in the 100 and 200 meters, was presented with the piece of wall at a small ceremony Sunday, the final day of the world championships. Free i Entertainment is reinventing the Kress restaurant with Rockers Saturdays and tomorrow we are proud to have the very talented House of Vibe All-Stars playing live. The House of Vibe is a music production company known for its versatile music styles. They have recently come off The Rock The Bells Tour where they backed up Chali 2na as he promoted his new album ‘Fish Outta Water’. Come see one of the best bands in LA this Saturday inside the Kress restaurant as they play reggae/hip hop classics and originals. Dj Pj Butta will also be mixing reggae, dancehall and hip hop to carry the dance vibe through out the night. This Saturday August 22nd night at ‘Rockers Saturdays’ we are proud to have The House of Vibe All-Stars performing Live inside the Kress restaurant. This is one of the most talented bands in Los Angeles so if you have never seen them it is a must you come check them out. They just got off the Rock The Bells tour where they backed up Chali 2na as he promoted his new album ‘Fish Outta Water’. House of Vibe will be bringing their reggae/hip hop vibe on Saturday as will our Dj Pj Butta who will be mixing the best in Dancehall and Hip Hop through out the night. Look out for the full write up on House of Vibe All-Stars in Tomorrows newsletter… Also be sure to check out our latest video of Damian Marley performing at ‘Rockers Saturdays’ at the Rock the Bells After Party.